The bottom line: Thelio, System76’s new “open hardware” desktop, is a small, beautiful, and powerful desktop computer that hits every high point anyone could have expected, faltering only in the inherent limitations of its small size. 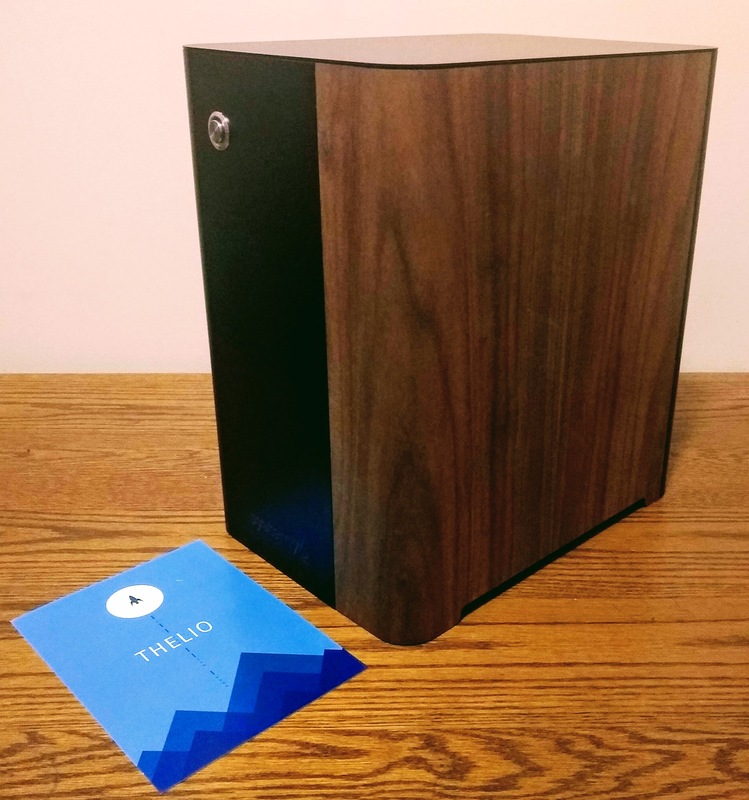 The front and wooden side of the Thelio thelio-r1 with the included post-card. The smallest Thelio, thelio-r1, was made available in January 2019. 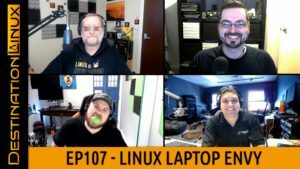 In November 2018, System76, renowned Linux laptop company, announced the Thelio though an ARG-like process of story-based videos. The product itself was rarely featured, but a good deal of hype built up around the whole affair. When specs and a configurator were finally made available, along with the details of the open source I/O add-in board and the manufacturing process that System76 was spinning up in Colorado, that hype appeared at least partially justified. I’ve had a Thelio for a couple of weeks now, and it’s pretty much lived up to its manufacturers lofty promises. The smallest Thelio, designated “thelio-r1”, stands 32 centimeters tall, 20 centimeters wide, and 28 centimeters deep, coming to only a total of 18 liters in volume, a good deal smaller than even the tiniest commercial full-GPU mITX form factor cases, most of which are at least 22 liters. The wooden side with the post-card and a 6inch/15cm ruler. thelio-r1 is absolutely tiny. The ruler in this photo is 15cm, or 6 inches. The front, sides, and top are all made of powder coated metal, colored a deep and even black. On the front and metal side are subtle laser-etched designs: a System76 logo and a Colorado mountainscape, respectively. Covering much of the right side and the right portion of the front is the wrap-around wood accent panel, which can be purchased in either dark maple or “high-contrast” cherry. The maple on my unit blends well with my dorm room furniture and will match with any natural or dark-colored desk or media console. For rooms with a lighter color scheme, the cherry version might be a better option. The wood is rough and not finished with a varnish or stain, which could leave it vulnerable to damage over time. Aside from a single LED-lit metal button, the front, top, and sides have no cutouts or ports. The case comes down in the front and back to touch the surface the computer rests upon, though four small rubber posts on the underside take the weight of the system itself. Between those areas there is a small cut-out section to permit sufficient airflow to the underside intake fan. The rear panel of the Thelio. The rear panel provides all the I/O on the entire system. The Intel version also includes a USB type C port, but either way, the small form factor will mean a shortage of USB ports. I recommend placing a USB 3.1 gen 2 hub either atop the machine or on your desk or console just beside it for easy access. Having machined cutouts for the back panel I/O is a boon for reliability and durability, but it does make upgrading the motherboard very difficult. On the other hand, System76 has chosen relatively high-end motherboards which are likely to be supported for some time; AMD in particular plans to release new CPUs on Socket AM4 as far out at 2022, making Thelio a long-term investment for those willing to pull out the guts of their machines once or twice. Clustering all the ports on the back contributes to the overall clean and modern aesthetic, as well as making it very easy to remove the entire wood and aluminum shroud. It requires only the removal of four tool-free thumb screws, which are powder-coated to the same color as the case. Once these are taken out, the whole case shroud simply slides up on a set of extruded rails that fit like a glove and are simple to slot back into place. The metal side of the Thelio, showing the mountainscape engraving. Thelio’s metal shroud is decordated with a beautiful stylized mountainscape, echoing its Colorado origins. The metal power button connects to the rest of the system via a set of four pins which slide in and out of their sockets with ease, comfortably long after the shroud has settled into its grooves; there’s little danger of bending them or missing the socket during shroud replacement. Within is a durable and competently engineered mini-ITX system. My unit came with a Radeon RX580 GPU and 16GB of RAM, and everything was properly cable managed, including the thin and bend-sensitive coaxial cables which feed into the WiFi and Bluetooth antennae. Because the right side panel is wood, not metal, these antennae can be entirely internal, leaving the exterior smooth and durable. The chassis design preempts much of the damage than occurs in typical systems when shipped with metal cross-bars and a well-secured GPU. The interior of the Thelio, showing off the excellent cable management. The interior cables are well-managed, which is important in such a tiny space. The case design centers on combination of miniaturized computing and modular storage. All systems ship with an NVMe drive mounted directly on the motherboard, and include four slots for SATA 6GB/s hard drives. These hard drives, as well as all the system fans, connect to a custom built open hardware I/O board which routes SATA traffic and performs smart fan management. The I/O board is reliable and low-latency, not impacting the read speed or seek times on my Samsung 850 or 860 EVO SSDs in any detectable way. It also provides enough juice via the SATA connectors to run four old and inefficient 1TB hard drives simultaneously. Unfortunately, at the time of writing, System76 does not make a configuration utility available for this I/O board, although they do provide kernel modules which allow Linux users to monitor temperatures and fanspeeds. The drive slots use rails designed to work with the 16 included vibration-isolating thumb screws, stored in specially machined screw-holes inside the chassis. Once inserted, some significant force is required to remove a drive, but not so much as to place the drive cage at risk of damage. Unsurprisingly, given the small volume of the system, the cage is too small to support 3.5 inch drives. A positive-pressure system fed through a filtered fan below the chassis provides cooling air to the CPU, which exhausts through a massive channeled fin cooler, and GPU, which blows out into the chassis. This reduces the potential of the system internals to build up dust as well as ensuring that the maximum amount of air passes through the heat exchanger, though it does have the potential to starve the GPU fans of room-temperature air. The bottom intake of Thelio, showing its Unix epoch solar system. Both of the Thelio’s vents show the solar system at the time of the UNIX epoch. The filter on this bottom intake does a good job even in the very dusty environment of my dorm. Though not as effective as liquid cooling, this system proved more than adequate for my system. I was unable to force the system’s temperature more than about 30℃ above ambient, providing plenty of headroom for voltage increases for those who wish to overclock. GPU temps were not nearly as good on my RX 580, reaching almost 50℃ above ambient, but I observed no thermal throttling. This likely depends on the CPU and GPU configured; luckily, the Thelio supports all tiers of current-gen AMD Ryzen and Intel Core CPUs and several Nvidia and AMD GPUs. Of course, no air-cooled system can be as quiet as a good water cooling solution, but the Thelio manages to keep its acoustic load low and low-pitched thanks to the two large, slow-spinning fans and the efficiency with which it uses the air they move. Because of the positive-pressure design, it can’t spin down its fans when cool, so the system is audible all the time, but it’s never obnoxious and rarely ramps up, even under load. The worst part of my Thelio experience was the waiting. Not that there was so much of it, mind you; System76 custom-builds each order in their Colorado factory and ships via UPS, so it arrived about 3 weeks after I ordered it, including the 5-day shipping, which can be upgraded. System76’s web-based configurator provides many options ranging from low-end to ultra-powered for CPU, GPU, storage, main memory, and even warranty. The company even includes the option to get a shipping label to a recycling facility for an old computer the Thelio might be replacing. The Thelio’s packaging did stand out in my campus mail center, with a huge stylized moon dominating the package’s top along with the word “Thelio” and the System76 logo. Inside was a simple postcard, some instructions on how to get customer support, and a great deal of what felt to me like very firm foam securing the system in place. The cardboard provides hand-holds for carrying, a welcome feature during my trek back across my frozen campus. The included Pop!_OS, despite having some of the worst naming on the Linux desktop today, provides a great Ubuntu-based experience with minimal but well-thought-out modifications to the GNOME 3 desktop. System76 included the drivers for my AMD RX 580 and a firmware update program for future use, though no updates were needed upon arrival. Unfortunately, there is no configuration utility for the custom I/O board, though while the provided open source drivers do make fan speed measurements available to the OS. The lack of the Ubuntu Snap subsystem by default makes access to many proprietary apps more difficult than necessary. On the other hand, the product is targeted at developers, and installing and using Snap support is trivial from the command line, so this isn’t too much of a black mark. The drive cage of my Thelio with one drive out of its slot. Drives are inserted on rails using vibration-isolating gromits. If only it were this easy to get RAID working! With so many drive slots, a graphical configuration utility for software RAID would be great; unfortunately, GNOME Disks no longer supports creating mdraid volumes, though it can manage them. Again, this is probably OK, as mdraid is simple to configure from the command line, though I did find that the motherboard used in the AMD model does not play well with partition-on-mdraid configurations; rather, each mdraid member needs to be partitioned and those partitions set up as members of the mdraid array. This is common, but disappointing. For all this, my Thelio weighed in at a hefty $1,866, plus $31 for 5-day UPS shipping. That’s not a trivial amount of money; I can easily build a respectable gaming computer for a quarter of that, and even a decent laptop workstation from Lenovo is just pushing $1,500. Larger Thelio models like the Thelio Major and Thelio Massive, which starts at $3000, and even higher-end configurations of the thelio-r1, can reach absolutely astronomical prices. After doing some math, though, it looks like the margins aren’t particularly high, especially for the level of integration and service provided. The Thelio costs about 18% to 22% more than the prices of the individual components; $200 dollars more than an almost equivalent PC Part Picker build for the base model, or about $400 more for my model. This gap widens only slightly with the ultra-high-end models. System76’s new “open hardware” desktop, is a small, beautiful, and powerful desktop computer that hits every high point anyone could have expected, faltering only in the inherent limitations of its small size. It’s pretty, it’s tiny, it’s fast, it’s well cooled, and the software support is top-tier. Despite being somewhat noisy and lacking front I/O, it’s certainly a good machine for any Linux user who can swallow the 18% - 22% upcharge for assembly and custom engineering. If you are a Linux user looking for a durable, competently engineered, and beautiful desktop PC, the System76 Thelio is for you, so long as you have a flexible budget. 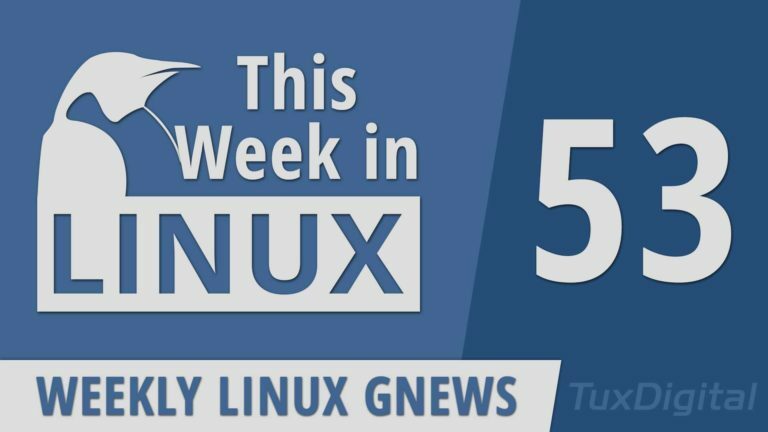 If you don’t currently use Linux and want to get started, the Thelio can still do what you need, but you might want to go with stock Ubuntu instead of Pop!_OS. If you’re a Mac OS developer who is looking to switch to Linux, I suggest checking out Mike Dominic’s review for a Mac user perspective. If you’re a software developer who likes to game, the Thelio is a no-brainer. With the off-the-shelf hardware and excellent expandability, you can easily add enough storage for even the largest games and, if needed, dual boot Windows. If you need more than one PCI-e expansion card, more than four USB ports, or more than about 12 TB of storage, you might want to look elsewhere, though the Thelio Major or Thelio Massive might meet your needs. If you’re comfortable building your own PCs and don’t need to fit a powerful system into a small space, you can save a buck by going that route instead, and probably end up with better thermals. Finally, if you need workstation power on the go, the Thelio is simply the wrong product, but System76, Lenovo, and Dell all offer excellent Linux-supporting portable workstations. A comprehensive review of the System76 Thelio (thelio-r1).